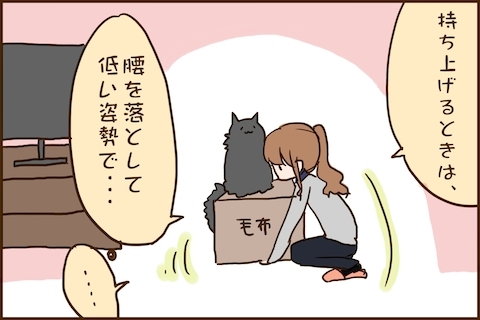 Where in the world would you expect to find a website that promotes shipping and moving services via the medium of a manga cat? Japan, of course! Hikkoshi More is a Japanese website which provides information on shipping, postage and moving services. 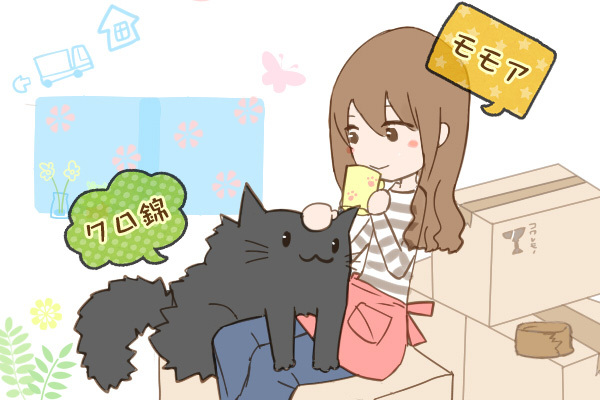 Instead of providing a whole lot of dull text, Hikkoshi More features a cute cat named Kuronishiki to help illustrate and explain information on shipping and moving services. Kuronishiki gives the articles a kawaii angle, and much of the information is presented in the form of manga – Japanese comics – to help make the information simple for readers to follow. 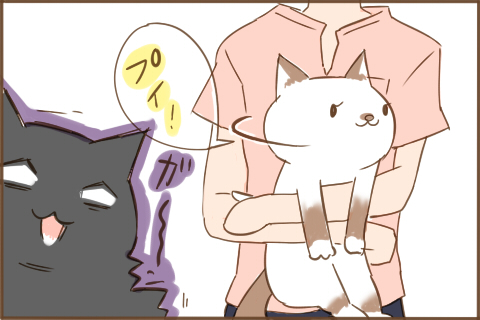 Kuronishiki and his owner even have their own profiles stating their age, hometown and interests. Kuronishiki is a three year old black cat from the Kanagawa Prefecture. His favourite foods are cheese, tuna and cabbage, and his favourite toys are cardboard boxes (well he is the mascot for a website that promotes shipping companies, after all!). 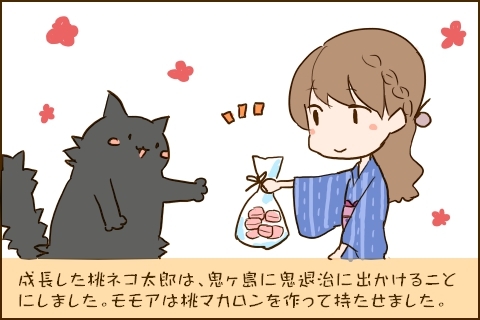 Oh, and apparently Kuronishiki also has a bit of a thing for white female cats! Kuronishiki’s friend/owner is a twenty-four year old woman named Momoa. She is an illustrator from Tokyo whose hobbies include travelling and watching anime. Together, Kuronishiki and Momoa explore various topics relating to shipping and moving. As well as being informative and more than a little kawaii, Hokkishi More injects an element of humour into its approach. Take for example this page. In one of the comic strips, Hokkoshi More parodies a well-known Japanese folk tale, The Legend of Momotarou – also known as Peach Boy. 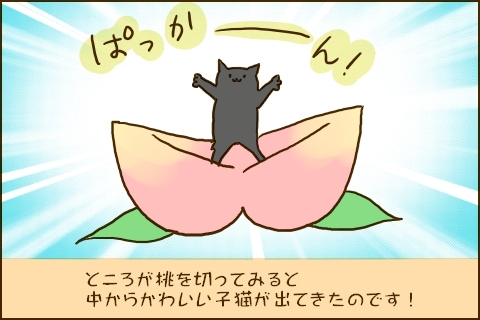 Yep, you guessed it – Kuronishiki plays the role of the main character in the form of ‘Peach Cat’! In the original story, an elderly couple is sad because they don’t have any children. Then they discover a giant peach which just so happens to have a baby in it – Momotarou, or ‘Peach Boy’. They’re thrilled, and they bring him up as their own son. When he’s older, Momotarou hears some people talking about how some demons have been causing them trouble. He sets off to fight the demons, and his parents give him a pack of his favourite spinach dumplings. On his journey, he meets a dog, a monkey and a bird, and gives them each one a dumpling before convincing them to join him on his mission. Together, they fight the demons and win, taking back the stolen treasure and redistributing it amongst the poor people in Momotarou’s town. Momotarou then marries the Emperor’s daughter and everyone lives happily ever after. 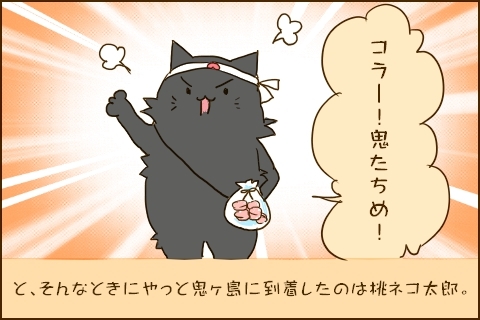 In the Hikkoshi More parody, Peach Cat is discovered by Momoa instead of an elderly couple and carries peach macarons instead of spinach dumplings. I’m not entirely sure what the story has to do with shipping, but maybe it ties into the part where the treasure is moved back to the village. Or maybe it’s just to develop the reader’s connection to Kuronishiki and Momoa. Either way, it seems like a uniquely Japanese form of promotion. Aside from random stories such as the parody of the The Legend of Momotarou, each story comes with an informative message for the reader, and the use of manga to illustrate the point. The above picture comes from an article on lifting heavy boxes. Trust Kuronishiki to add some extra weight to the box that Momoa is trying to lift! You can find out more about Hikkoshi More and see Momoa’s cute adventures with Kuronishiki by visiting http://more-hikkoshi.com. Disclosure: This post was sponsored by Hikkoshi More. All opinions are my own. All images copyright Hikkoshi More.